Violence and illiteracy may be natural but most of us don't remain illiterate for long. Many people argue that violence is a natural reaction to threats. This means we are born with that protective reaction and therefore we are naturally violent. Since I partly agree with this, I am willing to concede that point. However, I would add that we are also born illiterate but most of us don't remain illiterate. Does this mean our society is becoming more violent because we teach our kids to be violent? No. The student was pointing out that just as each child is born with the potential to learn to read and write, and gain all the benefits of literacy, each child is born with the potential to learn the ways of nonviolence, and gain all the benefits attached. Violent behaviour comes from not teaching our kids to be nonviolent. That only seems to be a double negative. Most people teach kids to be ‘not violent,’ which is very different to teaching kids to be 'nonviolent'. Teaching kids to be ‘not violent’ may achieve some level of ‘peace’ but it actually perpetuates violence. Confused? 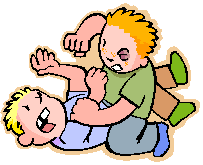 The main way most of us teach children to be ‘not violent’ is through the use of punishment or the threat of punishment , which means the natural violent reaction is suppressed by the fear of punishment. If there is little chance of being caught, the fear of punishment is taken away and a child is more likely to use violence. Nonviolence is difficult to define because it is not just the absence of violence. It is the opposite of violence; the antidote of violence. It is an attitude towards other people and to ‘rules of behaviour.’ Nonviolence defies violence and deprives it of any victory. Nonviolence disarms an aggressor without using violence. Nonviolent discipline can be aggressively confrontational, and even take a zero tolerance stance in holding people accountable for their violent behaviour, without resorting to any kind of punishment. Imposing a punishment often sets up a cycle of revenge that prevents any worthwhile lesson being learned. Experiencing the real consequence of an action is the most effective way people learn what acceptable and responsible behaviour is. One of the great advantages of nonviolent discipline in the home, school or workplace is the distinction it makes between punishment and consequences, allowing ‘restorative action’ to be taken instead of imposing punishment. This is not just spin because ‘taking restorative action’ and ‘imposing a punishment’ are mutually exclusive opposites. All of us are capable of thinking in both ways, because most of us take restorative action depending on the circumstances of a situation, but we cannot think in both ways at the same time. The above could explain why school discipline programs based on restorative practices, such as Responsible Thinking Classes, are not as effective as they could be. Maybe some of those running the programs are caught up by our cultural addiction to punishment. That could also be the reason why restorative programs in the criminal justice system don’t always produce excellent results. A punishment-minded person cannot effectively operate a program designed to be run by a restorative-minded person. Parents can introduce kids to the ways of nonviolence in the very first year of a child’s life. School children can be taught the art of nonviolence from day one. And it's never too late to start with older children. It won’t always work in every situation because few parents or teachers have the nonviolence training to recognise how their own attitudes are effected by the institutional, structural and social violence built into the culture we live in. But once we become aware of our own attitude, we can help children to live nonviolently in a violent world, and possibly change it.